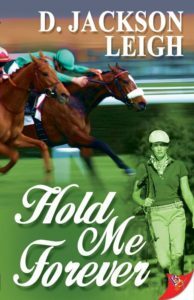 Hog-tied by her father’s financial predicament and mental decline, Whit Casey is not happy at being strong-armed to hire Mae, who knows nothing about quarter horse racing, to write for her racing magazine and dot-com. Still, attraction grows between the two women until Mae’s investigation into a horse cloning controversy implicates Whit and the colt she is depending on to stop the foreclosure of her father’s farm. It’s a race against time to clear the colt before the big race and claim what both women desire most in their lives, someone to hold them forever.